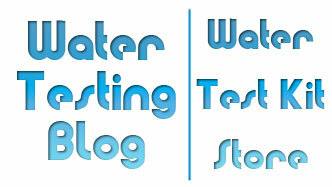 Well Water Test Kit That Includes Manganese and Magnesium? We recently received an inquiry from 'Marilyn' who asked, "I need to test my well water in order to determine the correct equipment to get for filtration and softening. Your sen safe water test kit seems the most appropriate, but I do not see tests for manganese and magnesium. Please advise." The kit does not contain tests for manganese but that kit is available on its own. We do carry a manganese test as a standalone kit, though. Regarding magnesium, that value is included in the total hardness reading given by the total hardness test included with the SenSafe Water Quality Test Kit. Note: The test gives a sum of calcium hardness and magnesium hardness levels, not individual concentrations. And finally, regarding performing testing for the purpose of determining the quality of your water so you can figure out the best treatment option, if you suspect that your water has potentially significant problems and/or health risks, then home water test kits should serve as a preliminary tests only and you should probably use the services of a certified water testing laboratory before investing in a water filtration system. If you do not wish to use the services of a local water testing laboratory (which your local health department could help you locate), then companies like National Testing Laboratories offer mail-in water testing services that provide results from a certified water testing laboratory usually within 10 business days. Earlier today we received an email from 'Jeanette' who asked, "Hi. 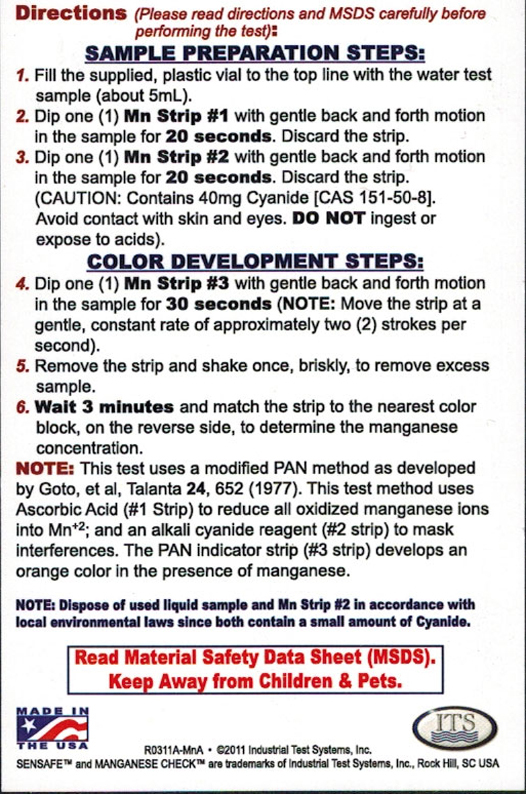 I was wondering how credible and accurate your Manganese test strips were. If you have any recommendations to measure Manganese that are more accurate, I'd like to hear them. Thank you!" Regarding accuracy, we really have not heard any complaints from users of the product. When we experimented with it years ago we found that it did a pretty decent job... for a dip-n-read style of test. The Well Water (Driller) version of the eXact Micro 20 Handheld Water Testing Meter (information available on this page: http://www.filterwater.com/pc-458-32-exact-micro-20-water-tester-kit.aspx) comes with testing materials for a number of important water quality parameters in addition to manganese. Is Manganese a Health Hazard? As a general rule manganese in drinking water does NOT present a health hazard, though in great enough concentration ANYthing could pose a threat to human health. Typically manganese in water presents itself as more a nuisance for laundry since it may cause black staining and for that reason water professionals suggest keeping its levels below 0.05mg/L (ppm). Should you find yourself in a situation where manganese levels in your water supply give you trouble, the following Propur water filters have been tested by an independent lab to reduce manganese levels in drinking water by >99%. 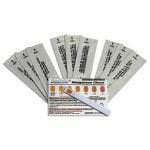 Do Metals Check Test Strips Detect Manganese? Good evening, Blair, and thank you for your inquiry. Yes, the SenSafe Heavy Metals Check product should detect dissolved Manganese since it typically has a +2 valence state for its electrons BUT do keep in mind that other dissolved metals, if present in your samples, will also yield positive results and the test kit will not differentiate between (or identify) the metals it detects. If you require a more manganese-specific test kit, then you may want to consider the SenSafe Manganese Check product which includes interference masking agents on each strip to reduce false positive readings given by metals other than Manganese. Normally if a homeowner finds that he or she has a higher than desirable level of ANY metals in his or her water, regardless of the metals’ identities, that person typically seeks out additional, more qualitative (i.e. laboratory) testing so that a decision regarding what filtering solution will work best for their unique water quality situation can get made. In the event that you do decide to seek out laboratory testing, we suggest first contacting your local health department to get a list of qualified water testing labs in your area. If that does not work then we suggest considering one of the WaterCheck Test Kits manufactured by National Testing Laboratories. Why is Mercury a Problem? Doesn’t It Flush Out Like Other Toxins? To a certain extent the human body CAN and DOES flush out most things (like metals) that it does not require or want to keep. BUT we must keep in mind that although the human body does function (usually) like a well-oiled processing machine, it does not always function perfectly and sometimes traces get ‘stuck’ in the system. Those stuck ‘traces of metals’ in the system may become a health hazard over time as their quantities increase with the body’s prolonged exposure to more metals. Additionally, in the case of heavy metals like mercury, for example, scientists have determined that some metals form bonds with organic materials within the body and get absorbed into the body. Those compounds will not leave on their own and overtime may cause a problem as their concentrations in the body increase. Heavy metals and the food chain? Our planet has a hierarchical food chain. Everyone knows that. But, did you know that cases of ‘mild contamination’ by heavy metals or other potential toxins at one level of the food chain may have innumerable effects on all levels above it in the food chain? Example: Fish in a river or lake become contaminated with mercury. We eat the fish. We become home to the mercury in the fish. Easy to test for metals in water? 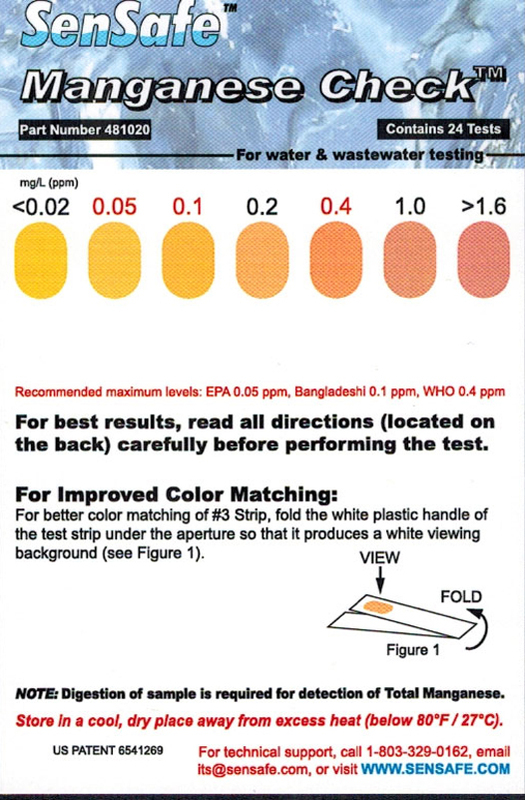 In some cases like mercury, arsenic, copper, iron, manganese, chromium, lead, and select others, simple at-home water test strips and water test kits exist. Other metals, however, can only get detected using sophisticated laboratory equipment and techniques. Is Demineralized Water Bad for Me? With so many people in the world out to make a dollar — usually at the expensive of others — it comes as no surprise that a number of companies have tried to find fault with reverse osmosis systems… because they do such a good job of removing contaminants from drinking water. Apparently some folks believe that water lacking ANY minerals will somehow cause problems for people who consume it as drinking water, cook with it, bathe in it, etc. While somewhat true that water produced by reverse osmosis may have ‘aggressive’ tendencies in certain plumbing situations, we have found that the largest ‘problem’ people have with demineralized reverse osmosis water… is its flat, boring taste and not its lack of minerals. Water’s ‘taste’ comes from its dissolved minerals content so it stands to reason that without any minerals would also have no ‘taste’ — a problem easily remedied by the use of a remineralizing cartridge after the reverse osmosis system. Don’t we need minerals in our water for health? Humans obtain the bulk of nutrients required for healthy living from the foods they eat… EXCEPT when they eat mostly (and too much) fried stuff like this. Eat healthy and drink clean water… and don’t buy into every ‘health trend’ and health fad’ that flashes on your television screen or in banner ads that pop up on web sites you visit. The water we drink needs to have unwanted impurities removed. End of story. If given a choice, we’ll take flat-tasting water over water containing potentially dangerous and/or bothersome levels of dissolved heavy metals (i.e. lead, copper, iron, manganese, chromium, arsenic, etc.) and other junk any day of the week! Often times the bad tastes and odors will seem noticeably stronger after a long period where the water has not run. Note: If you smell a “rotten egg” smell, this odor most likely comes from something other than iron bacteria. You may want to test, instead, for dissolved hydrogen sulfide in your water. Discoloration — Iron bacteria have a knack for leaving orange, brown, red or slightly yellow stains on your normally pristine white fixtures and may even cause water in toilets and toilet tanks to become discolored. Some folks (who have lots of iron bacteria in their water) have even reported seeing rainbow-colored oily residues on surfaces exposed to their water. Slimy Red Deposits — Should you happen to notice a sticky slime with a rust-like color — or possibly orange, brown, red, slightly yellow or even gray color — in your toilet tank, iron bacteria may have made their home in your water supply. So… Those Simple ‘Tests’ Always Work? Not even in a fairytale world, pal! Each of the ‘signs’ and ‘indicators’ of iron bacteria listed above could also come from drinking water contaminants such as ferrous iron, sulfate, hydrogen sulfide, manganese and/or other biological organisms frequently found in water supplies such as sulfur bacteria. So… How Can I Know for Sure That I’ve Got Iron Bacteria? No method other than having your water tested by a certified water testing laboratory (such as National Testing Laboratories) will tell you for certain whether or not you have iron bacteria in your water. How Can I Identify a Pool Stain? Back in the old days, pool water professionals had no way to determine the cause of a stain on pool liners, plumbing fixtures, steps, or stairs. They just tried every trick they could think of to remove them until they came off… IF they ever came off. These days, however, companies like Jack’s Magic specialize in making products that allow even the most inexperienced pool operator to quickly identify stains and remove stains. Pool owners/operators who’ve tried Jack’s Magic Stain Identification Kit say it has saved them countless hours of wasted labor (scrubbing!) by taking the guesswork out of the satin id’ing and removal process. How does it work? Quite simply, one of four (4) simple topical tests will pinpoint the nature of the stain and the included guide then tells users which Jack’s Magic Stain Removal product will work best to remove your swimming pool stain. Where do pool water stains come from? Typically stains result from unwanted water contaminants such as metals (i.e. iron, copper and manganese) which find their way into pool water via the fill water used to top off or initially fill up a swimming pool. Therefore we always suggest testing fill water before adding any chemicals. This simple step can save you tons of aggravation. Why? Because if you discover ahead of time that your pool water contains metals, you have the opportunity to add the correct sequestering compounds and metal chelating compounds before adding the sanitizers that would bind with metals, form precipitates, fall out of solution, and create stains. 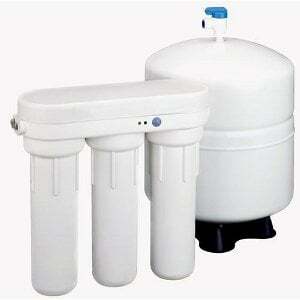 Need a test kit for your pool water? Take a look at Taylor-Test-Kits.Com or the eXact Micro 7+ Pool Testing Meter. Question: What is That Rotten Egg Smell? We get asked about this all the time, so once again we will address the topic of rotten egg smells in water… this time for a woman who suspects something has gone wrong with either her or her neighbor’s septic tank. In all honesty, Sandra, we do not have the credentials or knowledge to answer that question for you. We can, however, give you a quick education on hydrogen sulfide in drinking water. Water containing dissolved hydrogen sulfide gas produces an offensive (and VERY unpleasant) “rotten egg” or “sulfur” odor and will also have a similar taste. In a lot of cases the odor seems a lot stronger when one first turns on the water or runs hot water from the faucet. Higher temperatures result in the generation of hydrogen sulfide gas at a faster rate and this can make showering in water that contains hydrogen sulfide particularly unpleasant! Blame it on the hot water heater? Occasionally water that smells like rotten eggs will actually have acquired that smell from a corrosion control rod in the hot water heater. Over time the magnesium-based rod can chemically reduce sulfates in source water to hydrogen sulfide. If you only get the rotten egg smell from your hot water tap, check the corrosion control rod in your hot water tank. Can the rotten egg smell harm people? Aside from its noxious nature, it really does not present all that much of a danger unless the hydrogen sulfide fumes build up in confined spaces. High concentrations of hydrogen sulfide gas in the air can cause headaches and make people pass out… pretty much like any other gas. The bigger problem people face when dealing with hydrogen sulfide comes from its tendency to corrode iron, steel and copper — three commonly used metals for plumbing fixtures. It also tends to tarnish silverware and discolor copper and brass cooking utensils. In houses with hydrogen sulfide problems kitchen and bathroom fixtures will typically develop yellow or black stains and beverages such as coffee and tea will have odd discoloration. Foods cooked with hydrogen sulfide water may have unusual appearances and/or tastes. I’ve heard that water softeners can create rotten egg smells, too? While not as common as problems with the corrosion control bar in the water heater, yes, water softeners can serve as the source of hydrogen sulfide smells in water. Certain types of bacteria can flourish in the bed of a water softener where they will reduce any sulfate that passes through the bed to hydrogen sulfide. If you get a black slime on the inside of your water softener and a rotten egg smell to your water despite having no hydrogen sulfide detected in your source water, you may have a problem with bacteria in your water softener. Definitely possible! While water containing hydrogen sulfide by itself most likely will not cause disease, hydrogen sulfide smells can possibly come from sewage that certainly CAN can contain disease-producing contaminants. For that reason, health officials and water experts suggest testing for bacterial contamination when investigating a hydrogen sulfide smell in drinking water. Several different methods for getting rid of hydrogen sulfide in water exist, but as you can see, you must first figure out the source of the gas. Did it come from the source water (if you have well water)? Does it only show up in hot water? Do you have well water and a septic tank? Do you smell it outside of your home on not-so-windy days? Depending upon the source AND amount of hydrogen sulfide in water, shock chlorination, water heater alteration (changing the metal of the corrosion control rod), activated carbon filtration, oxidizing filtration, or oxidizing chemical injection may reduce or eliminate hydrogen sulfide in water. In certain cases the preferred method for reducing or eliminating hydrogen sulfide levels in water also has the added benefit of reducing/removing iron and manganese at the same time. 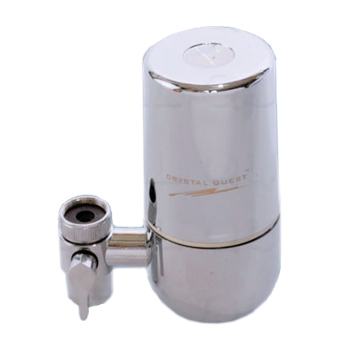 If you have very concentrations of hydrogen sulfide originating from your source water, a filter such as the Crystal Quest Faucet Filter may get rid of the smell using on of its 5 stages of filtration. 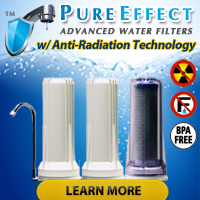 If you have higher concentrations of hydrogen sulfide in your source water, you may need to use a much larger systems such as the Crystal Quest Whole House Iron & Hydrogen Sulfide Filter which uses three stages of filtration to filter out unwanted contaminants… including up to 5 ppm (parts per million) of hydrogen sulfide, 15 ppm of total (ferrous & ferric) iron and 10 ppm of manganese. 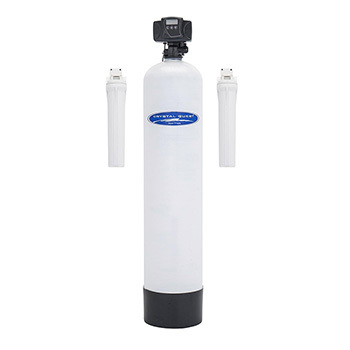 This particular water filter system works well as an add-on to aeration, chlorination, ozone or other pretreatment methods in cases where extremely high levels of hydrogen sulfide exist. Since we started this blog articles about ‘new’ dangers posed by lead in water have come up from time to time… and we have posted articles about them as soon as we became aware of them. Does that make us sensationalists or couriers of messages and news intended to make people cognizant of potential dangers posed by the possibility of lead in their drinking water? You will have to answer that question for yourself, and while you ponder that query, please also take a moment to think about the possibility that any number of manufacturing errors could possibly result in the improper distribution of lead in brass fittings — as alleged by researchers investigating alarmingly high levels of lead found in water produced by water fountains after technicians took several steps to make them lead-free. Hidden elements in drinking-water lines can shed large amounts of lead, a toxic heavy metal. And it’s quite legal, even if it does skirt the intent of federal regulations. University researchers, who uncovered this problem the hard way, have published a case study on the offending hardware in the November issue of the journal of the American Water Works Association. Lead adds ductility to brass, making it easier to bend or machine into desired shapes. To limit the risk of lead poisoning, U.S. law prohibits new brass plumbing parts in drinking water lines from containing more than 8 percent lead by weight. Yet two shut-off valves containing only about 6.5 percent lead leached toxic amounts of the metal into drinking fountains at the University of North Carolina. After reading that, and seeing how careful steps taken by knowledgeable people failed to get rid of all the lead in the plumbing of water fountains on a college campus, would you still think us alarmists by giving the topic a few minutes of publicity? What levels of lead in water pose a danger? The United States Environmental Protection Agency has ruled that public water systems may not contain more than 15 ppb of dissolved lead and that any system found to have that amount or greater in the water it distributes must take immediate steps to remedy the situation. While that sounds like a great plan, the fact remains that pretty much all lead found coming out of faucets in people’s homes entered the water at some point after the water left the water treatment facility. Old water service lines, fittings in people’s homes, and older solder used to join pipes all could contribute lead (and other metals) to the water they come in contact with — especially if the water has aggressive tendencies. Aggressive tendencies? Water can have a bad attitude and start fights? Well, no, but throwing water on someone in a bar or dance club will put them in a bad mood and possibly start a fight. When we say water has aggressive tendencies, we mean it has low total hardness and/or a low pH; both of which would make the water want to pull elements (metals and other things) out of any surfaces it comes in contact with. Enough evidence exists out there pointing to the fact that dissolved metals in water have a probability of causing health problems that we do not know WHY anyone would not want to test their drinking water (note: tap water and well water can both can contain dangerous concentrations of dissolved metals) for the presence of metals periodically. Should You Test Your Water If You Have City/Municipal Water? 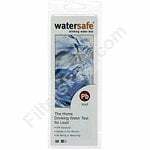 In both cases, and so many more, we would suggest getting a test kit such as the Water Quality Test Kit made by SenSafe or the City Water Test Kit made by WaterSafe… and doing some preliminary testing of their own. In most cases people complaining about city water will have problems caused by contaminants such as dissolved metals (i.e. lead, iron, copper, etc. ), chlorine content (free and/or total), total hardness (calcium and/or manganese), and/or rotten egg smells caused by dissolved hydrogen sulfide. If you get unusual or questionable results, definitely seek the services of a certified water testing laboratory; preferably one not affiliated with a water filter system distributor. 1) Accidental machinery malfunctions can occur. 2) City water travels through lots and lots of piping before it gets to your tap… meaning it passes over thousands of joints where leaks in the pipes could allow the introduction of dangerous bacteria. If you suspect for any reason that your water supply may contain bacteria, although home drinking water test kits work well as screening methods, times like this call for the services of a certified water testing lab. You local health department can suggest a water testing laboratory in your area or you can use a mail order laboratory such as National Testing Labs.